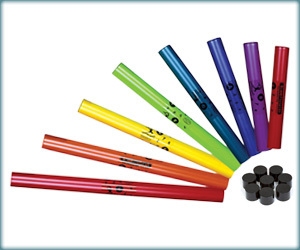 Our Boomwhackers Tuned Percussion Tubes are wonderful and unique instruments. These have already brought the joy of music to hundreds of thousands people. Sound is created by whacking the tube against any number of surfaces. The harder the surface, the stronger and brighter the attack will be. It’s an exceptionally playful way to introduce young minds to musical concepts. On top of that, there’s a social component as well. Given that any person can hold a maximum of 2 notes at a time, the group is encouraged to work together towards the desired melody. Available in several complementary sets. Expandable to a range of a whopping three and a half octave, fully chromatic. This enables you to make it as intricate or keep it as simple as you want in any given situation.